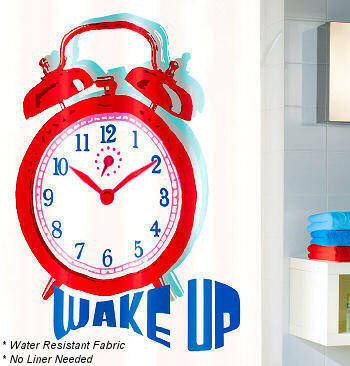 Our Wake Up shower curtain design features a ruby red alarm clock that measures 48in with the words WAKE UP in royal blue at the bottom of the clock. The clock face is in royal blue, ruby red and deep dark pink in a circle on the outside of the numbers. The shadow of the clock is light blue and the entire design is on a white background. Vita Futura offers the Wake Up design in a tub width size with 12 eyelets.